← Full Size 2 Section Touch Screen Karaoke Jukebox Hire-Easily Carried upstairs. 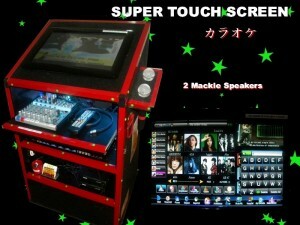 Karaoke Touch Screen Jukebox Hire Perth. 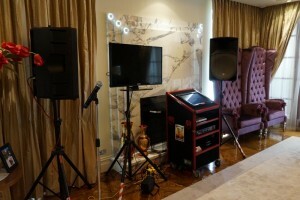 Touch Screen Video Karaoke Hire Perth. Touch Screen Karaoke Jukebox Hire with our Mega sound quality via the 2 Mackie speakers, large separate singers Tv, Shure wireless microphones, 2 super cool Party Lights and with the Biggest collection of songs in Perth, lots have background video’s.Also has a great selection of original music videos for when no one wants to sing.Popular with teenagers, adults and school functions. Free Delivery And Setup To Most Areas For The PARTYOKE JUKEBOX !! 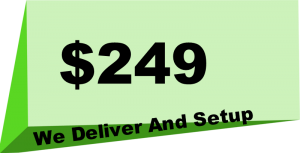 Hi Def Output On Separate 32″ Singers Tv On Stand. 2 Latest Effects Light Free Of Hire Charges. Karaoke All Decades, Music Videos. 1000’s of Popular Karaoke Songs From All Decades+Latest Hits, Best Selection In Perth. Large Selection Of Original Music Videos To Watch If You Want A Break From Singing. Cable To Connect Phones etc. PERTH’S BIGGEST AND MOST UPTO DATE SONG LISTINGS.